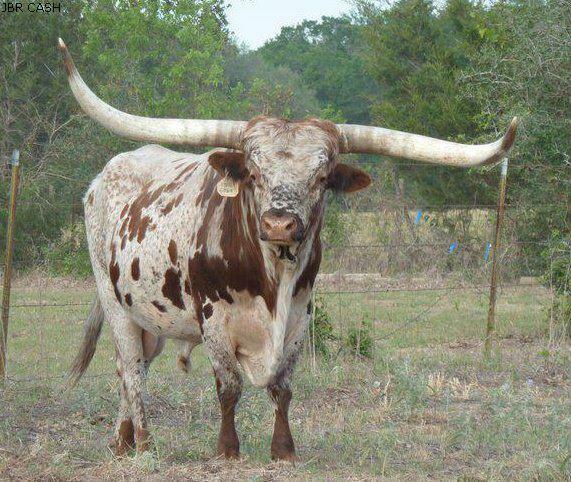 La Pistola Cattle Company breeding Registered Texas Longhorns. The TLBAA Horn Showcase was a great success for all involved. "JBR Cash" won 3 - 1st place bronzes again this year!! But even better than that, is that all his offspring that were entered into the show won, too! JBR Cash is proving himself as a top breeding sire this year and has earned himself a trip to Utah...... where he will naturally cover a top group of HCR cows. This breeding combo seems to really be working! JBR Cash's new measurements TH= 102.38" Composite Horn = 204.63" and TTT = 71.38"
Not only does he have the horn, but he is one of the biggest, longest and complete bull in the over 100" catagory. Calves available for sale now. Do you want to add Horn to your program?